This page documents the wonderful and winding path of Grumpenspiel, my robotic entertainment troupe. It is a group of MIDI synthesizers that make music and display light FX. Some fun costumes and stage decorations complete the party. Grumpenspiel makes music by moving motors to hit, pluck, and rattle stuff. This differentiates it from many robotic systems that generate synthesized electronic digital music or play sampled sound clips. 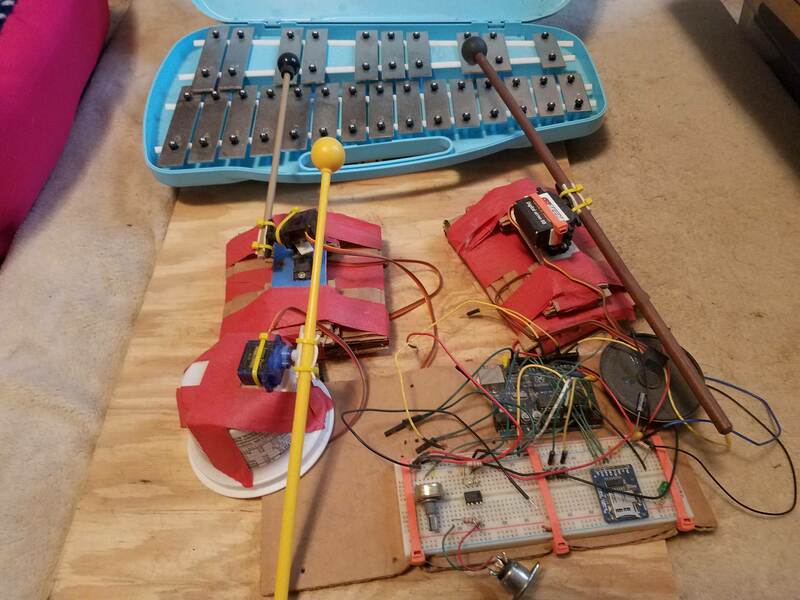 The goal of this project is to explore art that weaves together many disciplines including music, electronics, mechanics, programming, robotics, lighting, tailoring, etc to create a fun (A) outlet for the maker and (B) experience for the audience. Here’s a video of very early prototype proof of concept that got the ball rolling. A nice blooper reel to watch the $3 servos quickly come out of calibration…. The grand vision for Grumpenspiel centers around a pouting cat playing the xylophone. The image formed in my head, amused the hell out of me, and it grew from there. A good music act needs some supporting instruments, along with fun characters to play them. Light shows make any concert better. Dancers, robotic of course, round out the show. Each of the pieces is a stand alone module. This allows for incremental building, giving me a continuous stream of accomplishment. Finishing each component is satisfying and can immediately wow and amaze friends, family, and the Internet. Modular design also allows each component to be used in new and unusual ways. For example, sticking with MIDI standard communication lets me take an instrument out of Grumpenspiel and hook it up to any old keyboard MIDI controller. These are the dedicated visual FX that make it more fun to watch Grumpenspiel jam. Some of the Audio Synths above include their own light shows, but these listed down here are specifically visual. This section is for the control modules that instruct the audio and visual pieces what to do. Here is a parking lot for additional ideas. I jot them down here, maybe expand a bit on them later in this file while dreaming and brainstorming, and then move them up to the list above when they are more thought out. One xylophone player, the Frowny Feline, with three mallets, one each front paw and a tail. apply some logic behind the note distribution, allowing for some nice polyphonic chords. Something that plays some more bass notes. Simple tone generator - i’d like as little synthesized sound as possible, but there’s always room for a custom wave generator to bring an 80’s synth feel to the show. Design a fun logo, because after all, branding is everything! This section is of most interest to other MIDI buffs or tinkerers.